Justice Ranjan Gogoi - The Union government appointed Justice Ranjan Gogoi as the 46th Chief Justice of India (CJI). He will assume his post on October 3. He will be succeeding incumbent CJI Dipak Misra. Justice Gogoi will become the first Supreme Court judge from the north-east to be appointed as Chief Justice of India. Ibrahim Mohamed Solih - Ibrahim Mohamed Solih won the Maldives Presidential Election 2018, defeating incumbent President Yameen Abdul Gayoom. Elections Commission showed Solih had secured 58.3% of the popular vote. Arif Alvi - The ruling Pakistan Tehreek-e-Insaf's (PTI) candidate, Arif Alvi won the Pakistan Presidential Election 2018, defeating his two rival candidates Fazal-ur-Rehman and Aitzaz Ahsan. Ajit Mohan - Facebook has appointed Ajit Mohan as managing director and vice-president of the social networking site’s India operations. N. Ravi - N. Ravi, Publisher and former Editor-in-Chief of The Hindu, was unanimously elected Chairman of the Press Trust of India (PTI). Vijay Kumar Chopra - Vijay Kumar Chopra, Chief Editor of the Punjab Kesari Group of newspapers, was elected Vice-Chairman. Kamlesh Nilkanth Vyas - Renowned scientist Kamlesh Nilkanth Vyas has been appointed the secretary of the Department of Atomic Energy and chairman of the Atomic Energy Commission. Tajinder Mukherjee - Tajinder Mukherjee has taken over as the Chairman and Managing Director of National Insurance Company Limited (NICL). Vibha Padalkar - HDFC Life appointed Vibha Padalkar as its new managing director and CEO for a period of three years. The position had fallen vacant after Amitabh Chaudhry resigned to head Axis Bank. WhatsApp Grievance Officer - Under pressure to clamp down on fake messages, WhatsApp has appointed a grievance officer for India and has detailed out the process for users to flag concerns and complaints, including those around fake news. Anshula Kant - State Bank of India (SBI) has appointed Anshula Kant as Managing Director of the Bank. She has been appointed to the post for 2 years. Varun Dhawan and Anushka Sharma - Bollywood actors Varun Dhawan and Anushka Sharma were signed as the ambassadors of Skill India Campaign to promote and endorse the Skill India Mission, chaired by Prime Minister Narendra Modi. The duo, through their film ‘Sui Dhaaga - Made in India’, are saluting India’s entrepreneurs and skilled workforce. Prashant Kumar - State Bank of India announced that Prashant Kumar has taken charge as the Chief Financial Officer (CFO) of the Bank. Amitabh Chaudhry - Axis Bank announced that Amitabh Chaudhry has been appointed as its managing director & CEO from January 1, 2019, for a period of three years. Bimal Jalan - The Union Government has appointed former Reserve Bank of India governor Bimal Jalan as the head of the panel that has been tasked with selecting India’s next chief economic advisor (CEA). Moutaz Mousa Abdallah - Moutaz Mousa Abdallah has become Sudan’s new Prime Minister. Hima Das - India’s ace sprinter Hima Das was appointed as Sports Ambassador of Assam. Sardar Singh - Sardar Singh has announced his retirement from international hockey. He made the decision after a disappointing Asian Games where India failed to defend their title and had to settle for a Bronze medal. Kevin Systrom and Mike Krieger resigned - Kevin Systrom and Mike Krieger, the co-founders of the photo-sharing app Instagram announced to resign from their respective positions. Mike Krieger is the Chief Technical Officer, while Kevin Systrom is the Chief Executive Officer. They founded the photo-sharing app in 2010 and sold it to Facebook in 2012 for about USD 1 billion. Jack Ma - Jack Ma, the co-founder and executive chairman of Chinese e-commerce giant Alibaba, announced that he will step down as the head of the company in 2019. He named the company CEO Daniel Zhang as his successor. Swedish Prime Minister Resigned - Swedish Parliament ousts Prime Minister Stefan Löfven in vote of no-confidence. UN Champions of the Earth Award 2018 - Prime Minister Narendra Modi was awarded with the prestigious UN Champions of the Earth Award 2018, the highest environmental honour of the United Nations. The UN Environment jointly awarded PM Narendra Modi and French President Emmanuel Macron in the Policy Leadership category for their efforts regarding the creation of the International Solar Alliance. Narendra Modi for the Nobel Peace Prize - BJP’s Tamil Nadu unit President Tamilisai Soundararjan said she has ‘nominated’ Prime Minister Narendra Modi for the Nobel Peace Prize for launching the “world’s largest” health scheme. Statue of Unity - Gujarat Chief Minister Vijay Rupani announced that Prime Minister Narendra Modi will inaugurate the world’s tallest statue of Sardar Vallabhbhai Patel on October 31, 2018. Named as the 'Statue of Unity', the statue is currently under construction on Sadhubet island at Sardar Sarovar Dam near Kevadia Colony in Bharuch district, Gujarat. The construction work of the project was awarded to leading engineering company, Larsen and Toubro. The statue will be 182m tall, that is double the size of New York's Statue of Liberty (93 metres). Award for Entrepreneurial Vision - The Cochin International Airport was awarded for Entrepreneurial Vision, for its leadership in the use of sustainable energy. This world's first fully solar-powered airport proves that green business is good business. The Awards will be presented to them during the Champions of the Earth Gala in New York City, on the sidelines of the 73rd UN General Assembly. The gala will be hosted by actor and environmental activist Alec Baldwin and UN Environment Goodwill Ambassador Dia Mirza. Meryl Streep Award for Excellence - Actress Aishwarya Rai was honoured with the Meryl Streep Award for Excellence at the Women in Film and Television (WIFT) India Award. WIFT India is part of WIFT International, a network which promotes professional development and achievement for women in the film industry. Kalpana Chawla Haryana Solar Award - Haryana government decided to institute Kalpana Chawla Haryana Solar Award, named after the India-born US astronaut, to encourage the participation of scientists in the solar sector. Kalpana Chawla was the first Indian-origin woman to travel to space. Village Rockstars - Village Rockstars, an Assamese language feature film selected as India’s official entry for the Best Foreign Language Film category of the 2019 Academy (Oscar) Awards. Rima Das is the writer, director, cinematographer, editor and the producer of the film. Smita Patil Award - Anushka Sharma received the Smita Patil award for best actor. National Sports Awards - The National Sports Awards 2018 were announced. Cricket captain Virat Kohli and world champion weightlifter Mirabai Chanu will jointly be conferred with Rajiv Gandhi Khel Ratna award 2018. Mexican Order of the Aztec Eagle - Chairman and MD, JK Tyre & Industries Ltd., Dr Raghupati Singhania has been conferred with 'Mexican Order of the Aztec Eagle', the highest honour accorded to non-nationals by the Government of Mexico. Shilp Guru Awards - Union Minister of Textiles Smriti Zubin Irani presented ‘Shilp Guru’ and National Award to Master craft persons at a function held at Raipur, the capital of Chhattisgarh. Eight ‘Shilp guru’ and 25 National awards were presented for the year 2016. Shilp Guru’ is the highest award in the Handicraft sector in India. Kerala Tourism - Kerala Tourism has won two prestigious gold awards of the Pacific Asia Travel Association (PATA) for its innovative marketing campaigns. The awards were presented at a glittering function in Langkawi, Malaysia during PATA Travel Mart 2018. Vladimir Putin - Russian President Vladimir Putin will be in New Delhi on October 4 and 5 for the annual summit with Prime Minister Narendra Modi. Three MiG-21s are scheduled to be handed over to Russians based on a request from their Defence Minister to our Defence Minister. Antonio Guterres - United Nations Secretary-General Antonio Guterres will be on a four-day visit to India from October 1, 2018. The event will mark the launch of Mahatma Gandhi's 150th Birth Anniversary celebrations. He will also attend the joint inaugural ceremony of the First Assembly of International Solar Alliance, 2nd RE-INVEST Conference and Energy Ministers Meet of Indian Ocean Rim Association of States member countries on the same day in New Delhi. Venkaiah Naidu - Romania will open a consulate in Chennai. This was decided in a meeting between Vice President Venkaiah Naidu and Romania Prime Minister Viorica Dancila in Bucharest. Ashraf Ghani - Afghanistan President Ashraf Ghani was recently in India for visit. India is working with Afghanistan on Chabahar port and Air-Freight Corridor. Bilateral trade crossed the one billion dollar mark between two countries. Ram Nath Kovind - President Ram Nath Kovind was in the Czech Republic on the last leg of 3-nation Europe tour. He met Prime Minister Andrej Babis of Czech Republic. India and the Czech Republic signed five agreements as part of President Kovind's visit. Sushma Swaraj - External Affairs Minister Sushma Swaraj left for a two-day visit to Moscow, Russia. During this visit, she will attend the meeting of 23rd India-Russia Inter-Governmental Commission on Technical and Economic Cooperation (IRIGC-TEC). Venkaiah Naidu - Vice President Venkaiah Naidu embarks on a three-nation visit to Serbia, Malta and Romania. Shavkat Mirziyoyev - President of Uzbekistan, Shavkat Mirziyoyev is on two day visit to India. Oman Defence Minister visited India - Sayyid Badr Saud Harib Al Busaidi, the Minister Responsible for Defence Affairs, Sultanate of Oman, is on an official visit to India at the invitation of Raksha Mantri Smt Nirmala Sitharaman. Tran Dai Quang - Vietnam's President Tran Dai Quang passed away on September 21, 2018 in a military hospital in Hanoi after a prolonged serious illness. Jain Muni Tarun Sagar - Jain Muni Tarun Sagar passed away at the age of 51 in Delhi. Kalpana Lajmi - Renowned filmmaker Kalpana Lajmi passed away in Mumbai. She was known for her women-oriented films like "Rudaali", "Daman", "Darmiyaan". Anna Rajam Malhotra - India’s first woman IAS officer after Independence, Anna Rajam Malhotra died in Mumbai. Vijay Shankar Vyas - Renowned agricultural economist and former PM's Economic Advisory Committee member Professor Vijay Shankar Vyas died after a brief illness. Conference on Academic Leadership on Education for Resurgence - Prime Minister Narendra Modi inaugurated the Conference on Academic Leadership on Education for Resurgence in New Delhi. The conference saw participation from the Vice-Chancellors and Directors of more than 350 universities. First Assembly of International Solar Alliance - The Ministry of New and Renewable Energy is organising the First Assembly of International Solar Alliance (ISA); the 2nd Indian Ocean Rim Association (IORA) Renewable Energy Ministerial Meeting and the 2nd Global Renewable Energy Investment Meeting and Expo, (REINVEST- 2018) in New Delhi. The three events will be inaugurated in a common function by Prime Minister Shri Narendra Modi in the presence of Antonio Guterres, Secretary General of United Nations on October 2, 2018. G-20 Trade And Investment Ministerial Meeting - Commerce and Industry Minister Suresh Prabhu participated in G-20 trade and investment ministerial meeting at Mar del Plata in Argentina. Global Mobility Summit - India’s first-ever Global Mobility Summit – ‘MOVE’ will be inaugurated by Prime Minister Narendra Modi in New Delhi on September 7, 2018. The Summit, organised by Niti Aayog, will deliberate on steps to promote electric vehicles and shared mobility. Interfaith Alliance Forum - The UAE will host the Interfaith Alliance Forum in Abu Dhabi on November 19-20, 2018. The forum aims to address and discuss social challenges and to strengthen efforts by religious leaders to formulate cohesive ideas that enhance the protection of the young individuals from extortion and crime via the internet. Global Call to Action on the World Drug Problem - Swaraj attended the Global Call to Action on the World Drug Problem chaired by Trump as the high-level week of the 73rd Session of the UN General Assembly began in New York. Women Foreign Ministers Summit - First Summit of Women Foreign Ministers was held in Montreal, Canada. General Assembly of the International Solar Alliance - The first General Assembly of the International Solar Alliance (ISA) will be inaugurated on October 2, 2018 in Delhi. The Ministerial level Assembly will be held in Greater Noida the following day. East Asia Summit- Economic Ministers Meeting - Commerce & Industry Minister Suresh Prabhu attended the 6th East Asia Summit- Economic Ministers’ Meeting (EAS-EMM) and 15th India-ASEAN Economic Ministers’ Meeting (AEM) in Singapore. Singapore is currently holding the Chair of ASEAN. Global Climate Action Summit - The Global Climate Action Summit 2018 was held during September 12-14, 2018 at San Francisco, California, United States. Smart City Expo India - Vice president M. Venkaiah Naidu inaugurated Smart City Expo India-2018 in Jaipur. Conference on E-Mobility in Indian Railways - A Conference on “E-Mobility in Indian Railways” organized by Ministry of Railways through Institution of Railways Electrical Engineers (IREE) in association with NITI Aayog concluded in New Delhi. World Summit on Accreditation - Union Minister for HRD Prakash Javadekar Inaugurates 4th World Summit on Accreditation (WOSA-2018) at New Delhi. WOSA is a biennial Summit organised by NBA, which provides platform to stakeholders to share their knowledge and information on accreditation. International Aviation Summit - The International Aviation Summit began in New Delhi. The seminar has been jointly organised by the Airports Authority of India, Ministry of Civil Aviation and International Air Transport Association (IATA). World Hindu Congress - The World Hindu Congress (WHC-2018) was held in Chicago, United States. It was organised to commemorate 125 years of Swami Vivekananda’s historic Chicago address on September 11, 1893. The theme of WHC-2018 was “Sumantrite Suvikrante — think collectively, achieve valiantly”. It was second edition of World Hindu Congress and was attended by Vice President Venkaiah Naidu. International Ayurveda Congress - The 4th International Ayurveda Congress (IAvC) was inaugurated by the Union Minister of State for AYUSH Shripad Yesso Naik in Netherlands on September 1, 2018. Izmir International Tradeshow - India is the Partner Country in the 87th Izmir International tradeshow which begins in Izmir, Turkey from September 7, 2018. Global Food Fair - Global food fair will be held in November in New Delhi. Chef Sanjeev Kapoor will be the brand ambassador of the event at the World Food India 2017. Supreme Court upheld Aadhaar Act - Supreme Court on upheld most of the provisions of the Aadhaar Act while hearing the petitions challenging the constitutional validity of Aadhaar (Targeted Delivery of Financial and Other. Subsidies, Benefits and Services) Act, 2016. According to Aadhaar Act - private entities cannot use Aadhaar for verification purpose, Aadhaar - PAN Linkage is mandatory, No need of Aadhaar for CBSE, NEET, UGC and school admissions, No need of Aadhaar for mobile connections and for opening bank accounts. Voter Verifiable Paper Audit Trail - The Election Commission said the supply of VVPATs (Voter verifiable paper audit trail) for use in the Lok Sabha polls in 2019 was on track and that it was committed to 100% deployment of machines at all polling stations in the future. The Commission has placed an order of 17.45 lakh VVPATs to Bharat Electronics Limited and Electronics Corporation of India Limited for use in the coming Lok Sabha elections. Face Authentication on hold - The telecom department has put Aadhaar-based face authentication on hold pending the Supreme Court judgement on petitions challenging issuance of new mobile connections and re-verification through the use of the unique identity. Ordinance Issued to Dissolve MCI - An ordinance was issued dissolving the Medical Council of India (MCI) and replacing it with a seven-member Board of Governors led by NITI Aayog Member Dr. V.K. Paul. A Bill to replace the MCI with a National Medical Commission is pending in Parliament. Live Streaming of Supreme Court Proceeding - Supreme Court of India allowed live streaming and video recording of court proceedings across the country. Supreme Court asked the government to frame rules in this regard under Article 145 of the Constitution. Manipur Mob Violence Control and Prohibition Bill - Manipur cabinet decided to introduce the Manipur Mob Violence Control and Prohibition Bill to stop increasing incidences of lynchings in the state. Creation of Legislative Council - The Odisha State Assembly passed resolution seeking creation of Legislative Council (Vidhan Parishad or second house of legislature). Dissolution of Telangana Legislative Assembly - The Telangana Cabinet passed a resolution calling for the dissolution of the Telangana Legislative Assembly and seek fresh elections six months ahead of schedule. Complete Electrification of Indian Railways - Union cabinet approved a proposal for the complete electrification of Indian Railways by 2021-22, reducing dependence on imported fossil fuel and saving revenue for the national carrier. The move will cost the government Rs12,134 crore. No NOTA In Rajya Sabha Election - Election Commission of India withdrew the provision of NOTA (None of the above) option from ballot papers of the Rajya Sabha and the state’s Legislative Council polls as per the Supreme Court directive. The NOTA option will be available only in Lok Sabha and state’s assembly election. National Register of Citizens of Assam - The Supreme Court ordered resumption of filing of claims and objections by around 40 lakh people who were left out in the draft National Register of Citizens (NRC) of Assam. The apex court granted this second opportunity to the citizens keeping in mind the "magnitude" of the issue. The National Register of Citizens (NRC) is a list that contains names of Indian citizens of Assam. The first draft of the NRC for Assam was published on December 31, 2017 and it incorporated the names of 1.9 crore people out of the total 3.29 crore applicants. National Registry of Sexual Offenders - In a first, the Union Government will release a National Registry of Sexual Offenders. With the launch, India will become the ninth country to maintain such a thorough database. The database would mainly include key details of the convicted sexual offenders such as their names, photographs, residential address, DNA samples, fingerprints, Aadhaar numbers and Personal Account Numbers (PANs). Saridon and FDCs - The Supreme Court of India allowed the sale of popular painkiller Saridon and three other banned fixed-dose combinations (FDCs). The Fixed Dose Combination drugs are two or more drugs combined in a fixed ratio into a single dosage form. Union Health Ministry issued a notification last week prohibiting the manufacture, sale and distribution of 328 Fixed Dose Combinations (FDCs) for human use with immediate effect. Instant Triple Talaq - The Union Cabinet approved an ordinance making instant triple talaq a punishable offence. The clearance by the Union Cabinet takes the bill a step closer to becoming a law. Mumbai-Ahmedabad High Speed Rail Project - Japan has granted a loan of Rs. 5,500 crore for the Mumbai-Ahmedabad High Speed Rail Project (MAHSR). The Japan international Cooperation Agency (JICA), the funding body in charge of the bullet train project, simultaneously issued Rs. 1,600 crore for the metro rail system between Howrah Maidan to Salt Lake Sector V.
Online Museum on Railway - Railway enthusiasts worldwide can now undertake a virtual journey with the Indian Railways on Google’s Arts and Culture platform. The Ministry of Railways partnered with the Google for an online showcase of its history, museums as well as some of the network’s more scenic routes. The virtual tour will enable users to explore more than 150 different places associated with the Indian Railways. Parakram Parv - Prime Minister Narendra Modi on September 28, 2018 inaugurated the Parakram Parv in Jodhpur to mark the second anniversary of the surgical strikes carried out by the Indian army on September 29, 2016. Wind Augmentation PurifYing Unit Installed - Union Minister for Science & Technology and Earth Sciences and Environment Dr. Harsh Vardhan inaugurated air pollution control device WAYU (Wind Augmentation PurifYing Unit) for traffic junctions at ITO intersection and Mukarba Chowk in New Delhi. WAYU is developed by Council of Scientific and Industrial Research – National Environmental Engineering Research Institute (CSIR-NEERI). 150th birth anniversary of Mahatma Gandhi - President Ram Nath Kovind launched the logo and the web portal for commemoration of 150th birth anniversary of Mahatma Gandhi, that is observed in the form of two year long celebrations from October 2, 2018 to October 2, 2020 across the country and all over the globe. Power Tariff on Record High - Power tariff touched a decade high of Rs 17.61 per unit in the spot market due to low hydro and wind energy production and coal shortage at thermal plants. “Spot power price for supply touched almost 10-year high of Rs 17.61 per unit in spot trading on Indian Energy Exchange (IEX) on 30 September. High Pollution in Delhi - Pollution level in Delhi has gone up due to local factors. The Air Quality Index (AQI) was recorded at 159, according to the Centre’s System of Air Quality and Weather Forecasting and Research Institute (SAFAR). An AQI in the range of 0-50 is considered ‘good’, 51-100 ‘satisfactory’, 101-200 ‘moderate’, 201-300 ‘poor’, 301-400 ‘very poor’ and 401-500 ‘severe’. Tsunami in Indonesia - The death toll from a powerful earthquake and tsunami in Indonesia leapt to 832 on 30 September. Habibganj Railway Station - The Habibganj railway station in Madhya Pradesh is India’s first to be reconstructed on the lines of Germany’s Heidelberg railway station. The station is being redeveloped by Indian Railway Stations Development Corporation (IRSDC) along with a private firm, the Bansal Group. It will become the first railway station in the country to be redeveloped under the PPP (Public-Private Partnership) model. Rail Heritage Digitisation Project - Union Railway Minister Piyush Goyal launched the ‘Rail Heritage Digitisation Project’ of Indian Railways in collaboration with Google Arts and Culture Association. The first-of-its-kind project aims to showcase India’s rail heritage to the national and international audience in an online story-telling platform. The railways will also be setting up 22 digital screens across different locations in India for showcasing the historical project. Sustainable Alternative towards Affordable Transportation (SATAT) Initiative - Union Petroleum Minister, Dharmendra Pradhan will launch the Sustainable Alternative towards Affordable Transportation (SATAT) initiative in New Delhi, on the penultimate day of the ongoing Swachhta Hi Seva campaign. The Minister will launch the initiative to set up Compressed Bio-Gas (CBG) production plants and make available the biogas in the market for use in automotive fuels. Centre of Excellence for Data Analytics - Information Technology Minister Ravi Shankar Prasad launched Centre of Excellence for Data Analytics (CEDA) in New Delhi. Sabarimala Ayyappa Temple - The Supreme Court of India allowed the entry of women into the Sabarimala Ayyappa temple in Kerala. Amalgamating Police Forces in Six Union Territories - The Ministry of Home Affairs has notified new rules amalgamating police forces in six Union Territories. The National Capital Territory of Delhi, Andaman and Nicobar Islands, Lakshadweep, Daman and Diu, Dadra and Nagar Haveli and Chandigarh (Police Service) Rules, 2018, was notified on September 25. Pakyong Airport in Sikkim - Sikkim’s first-ever airport was inaugurated by Indian Prime Minister Narendra Modi at Pakyong. It is 100th operational Airport of India. Jharsuguda Airport in Odisha - PM Narendra Modi inaugurated the airport at Jharsuguda. Prime Minister also flagged off the UDAN flight on Jharsuguda-Raipur sector. Kishau dam on Tons River - Haryana government has given its go ahead for the construction of Kishau dam on Tons river, a tributary of the Yamuna. With the construction of this dam, Haryana would get additional 709 cusecs of water for drinking and irrigation purposes. World’s First Hydrogen-Powered Train - Germany has rolled out the world’s first hydrogen-powered train. The two Coradia iLint trains were built by French train-maker firm Alstom. National Rail and Transportation Institute - The first of its kind university in the country in the transport sector, the National Rail and Transportation Institute (NRTI), started operations. Currently, it is functioning out of the National Academy of Indian Railways, Vadodara. International Center for Transformative Artificial Intelligence - NITI Aayog, Intel and Tata Institute of Fundamental Research (TIFR) are collaborating to set up a Model International Center for Transformative Artificial Intelligence (ICTAI) in Bengaluru. Ayushman Bharat Call Centre - Ayushman Bharat call centre was formally inaugurated in Bengaluru by CEO of Ayushman Bharat Dr. Indu Bhushan. This national call centre is operational since August 25. Ethanol Plant in Panipat - Haryana government signed a MoU with Indian Oil Corporation (IOC) to set up an ethanol plant in Panipat with an outlay of over Rs 900 crore. Nuakhai Festival - The festival of Nuakhai is being celebrated in Odisha. Country Digital Acceleration programme - Cisco, a U.S.-based firm, that makes networking telecommunications equipment, has signed two agreements with the NITI Aayog and Bharat Sanchar Nigam Limited (BSNL) to speed up its Country Digital Acceleration programme in India. Jaipur Literature Festival - The Jaipur Literature Festival began in Houston at the Asia Society of Texas, USA. The inaugural session also saw Congress leader and writer Shashi Tharoor discuss his book “Why i am a Hindu” with writer Namita Gokhale. Finnish Company Fluido - Infosys has acquired Finnish company Fluido, a top consulting partner of Salesforce, for 65 million euros (about Rs 545 crore). India Tourism Mart - Union Minister for Railways and Coal, Piyush Goyal inaugurated the ‘first ever’ India Tourism Mart (ITM 2018). India International Convention and Expo Centre - Prime Minister Narendra Modi will lay the foundation stone for India International Convention and Expo Centre (IICC) in New Delhi. Jan Dhan Darshak App - Finance Minister Launches Jan Dhan Darshak app. The application will act as a guide for the common people in locating a financial service touch point at a given location in the country. Loan Facilities for MSME - Union Minister of Finance and Corporate Affairs, Arun Jaitley launched www.psbloansin59minutes.com web portal. The web portal will enable in principle approval for Micro, Small and Medium Enterprises (MSME) loans up to Rs 1 crore within 59 minutes from Small Industries Development Bank of India (SIDBI) and 5 Public Sector Banks (PSBs) - State Bank of India, Bank of Baroda, Punjab National Bank, Vijaya Bank and Indian Bank. Merger of Three Public Sector bank - The Union Finance Ministry announced the proposal to merge three public sector lenders - Bank of Baroda, Dena Bank and Vijaya Bank. The combined lending entity will create India’s third largest bank with a total business of more than Rs 14.82 lakh crore. The proposal will now need the approval of the boards of these individual banks. The consolidation was proposed by the Alternative Mechanism comprising Chairperson Arun Jaitley. Vijaya Bank Approved Merger - The board of state-run Vijaya Bank gave in-principle approval for its merger with Bank of Baroda along with another PSU lender Dena Bank. Dena Bank Approved Merger - Dena Bank Monday approved its merger with Bank of Baroda along with another state-run lender Vijaya Bank. India Post Payments Bank - The Indian Prime Minister, Narendra Modi on September 1, 2018 launched the India Post Payments Bank (IPPB) at Talkatora Stadium in New Delhi. The IPPBs will have 650 branches and 3250 access points across the country. Internal Ombudsman in All Scheduled Commercial Banks - The Reserve Bank of India (RBI) asked all scheduled commercial banks with more than 10 branches to appoint an Internal Ombudsman (IO). The apex bank has, however, excluded regional rural banks (RRBs) from appointing IOs. GDP Growth of First Quarter - According to Central Statistics Office (CSO) Indian economy grew by 8.2% in the first quarter (April-June) of the current fiscal, the highest in over two years. Financial Software and Systems - India Post Payments Bank (IPPB) has partnered with Financial Software and Systems (FSS). FSS a payments technology company to ensure that micro-merchants are able to accept payments over any channel – online, unified payments interface (UPI), quick-response (QR) codes, Aadhaar and IPPB accounts. Infrastructure Finance & Leasing Services defaulted - Infrastructure Finance & Leasing Services, which is facing a severe cash crunch, along with 40 other group companies, filed an application with the Mumbai Bench of the National Company Law Tribunal (NCLT). Natural Disasters Cess - Government constituted a seven-member ministerial panel headed by Bihar Deputy Chief Minister Sushil Modi to examine modalities for revenue mobilisation in case of natural calamities and disasters. Group of Ministers (GoM) will report for imposing 10% cess on GST. The panel would submit its report to the GST Council by October 31. RBI’s New Guidelines for Bandhan Bank - The central bank has frozen remuneration of Bandhan Bank CEO Chandra Shekhar Ghosh and opening up of new branches until further notice. Kolkata-based Bandhan Bank was not able to bring down the shareholding of Non-Operative Financial Holding Company (NOFHC) to 40% as required under the licensing condition. WTO Forecast World Trade - The WTO forecast world trade in goods would grow by 3.9 percent this year, less than the 4.4 percent it forecast in April. Next year trade growth of 3.7 percent is expected, a cut from the WTO’s previous forecast of 4.0 percent. Government acquired GST Network - The Cabinet approved the acquisition of privately-held equity in the GST Network (GSTN), which will make the not-for-profit company 100% government-owned. After the acquisition, the central and state governments would hold 50% each of the company. Currently, 51% shares are held by five private financial institutions — HDFC, HDFC Bank, ICICI Bank, NSE Strategic Investment Co and LIC Housing Finance. The remaining is split equally between the Centre and states. GSTN Board Restructured - The GSTN board will now comprise of 11 directors: Three each from the the Centre and the states, three independents, along with one chairman and a chief executive officer. 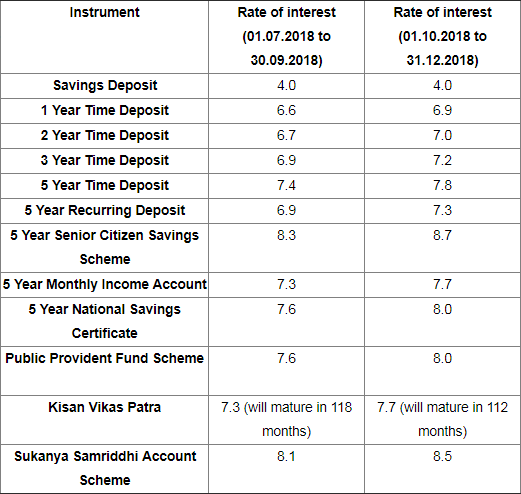 Interest Rates Raised on Small Savings Schemes - The government has raised interest rates on Small Savings Schemes (SSS), including National Savings Certificate (NSC) and Public Provident Fund (PPF) by up to 0.4% for the October-December quarter, in line with rising deposit rates in the banks. Uniform Tax Rates on Petroleum - Northern states of Punjab, Haryana, Uttar Pradesh, Himachal Pradesh and Union Territories of Delhi and Chandigarh have agreed to fix uniform tax rates on petroleum products, amid rising fuel prices. Besides, these states and UTs also have agreed to bring uniformity in taxes on liquor and registration of vehicles and transport permit. TCS on E-commerce - The Central Board of Indirect Taxes and Customs (CBIC) said E-commerce companies will from October 1 have to deduct 1 per cent tax collected at source (TCS) before making payments to their suppliers. GST Collection Improving - Finance Minister said the states were on the path of meeting their revenue targets by themselves, thereby not needing compensation from the Centre after the five-year period of its implementation. He said the deficit in revenue collection targets of states under the GST came down to 13 per cent till August this year compared to 16 per cent last year. FDI in the Telecom Sector - FDI in the telecom sector has jumped nearly five times in the last three years – from USD 1.3 Billion in 2015-16 to USD 6.2 Billion in 2017-18. Custom Duties Hiked - The Union Government hiked custom duties 19 items, including jet fuel, ACs and refrigerators to curb imports of non-essential goods. The hike was put into effect from midnight of September 26-27. The hike is aimed at narrowing the Current Account Deficit. Azim Premji University report on Unemployment - According to Azim Premji University report, unemployment scenario is most ‘severe’ in the northern states of the country. A new feature of the economy is a high rate of open unemployment, which is now over five percent overall, and a much higher 16% for the youth and the higher educated. The brisk economic growth is not leading to enough jobs with less than one percent growth in employment creation, it added. ADB’s Report on India’s GDP - Asian Development Bank (ADB) predicated India’s GDP growth at 7.3 per cent for current fiscal year. New Development Bank Approved Loan for Madhya Pradesh - BRICS' New Development Bank has approved a $525-million loan for infrastructure projects in India. The loan will be used by the Indian government for on-lending to the Madhya Pradesh government for rehabilitating major district roads with a total length of about 2,000 km. Fitch Rating Agency - Global research agency Fitch has raised India’s growth forecast for the current fiscal to 7.8 per cent from the earlier 7.4 per cent. Forecast of other agency are different. RBI - 7.4 per cent, Government - 7.5 per cent, International Monetary Fund - 7.3 per cent. BSNL signed pact with Softbank - BSNL has inked a pact with Japan’s Softbank and NTT Communications to roll out 5G and internet of things (IoT) technology in India in 2020. BSNL will look at collaborating with Softbank for its satellite constellation which will have around 900 satellites. Infrastructure Leasing & Financial Services Limited defaulted - Infrastructure Leasing & Financial Services Limited (IL&FS) defaulted on one of its commercial paper. This was the third default by the company. State-owned LIC is the largest shareholder with a fourth of the firm’s equity, while Japan’s Orix Corporation owns 23.5 per cent. Videocon Defaulted - Venugopal Dhoot’s Videocon Industries is going into bankruptcy for defaulting on debt worth Rs 20,000 crore. Penalty on Yes Bank - Yes Bank has paid Rs 38 crore in fines to the GST department for alleged violations in domestic remittances. Rana Kapoor - RBI directed current CEO and MD Rana Kapoor to step down by end-January. SEBI relaxed KYC Norms for FPIs - Securities and Exchange Board of India (SEBI) relaxed the Know Your Client (KYC) requirements norms for the Foreign Portfolio Investors (FPIs) after considering the interim recommendations of the SEBI working group under the Chairmanship of Harun R Khan. Post Payment Bank and Bajaj Allianz signed Agreement - India Post Payments Bank (IPPB) and Private Life Insurer Bajaj Allianz Life Insurance Co Ltd (BALIC) entered into a strategic partnership to provide life insurance solutions, especially at the doorstep of every household in the country. Cyber Insurance Policy of HDFC ERGO - HDFC ERGO, India's third-largest non-life insurance provider in the private sector, announced the launch of 'E@Secure', a Cyber Insurance Policy for individuals. Current Account Deficit widened - India’s current account deficit (CAD) widened to a four-quarter-high at 2.4% of gross domestic product (GDP) in April-June period on the back of rising crude oil prices, from 1.9% of GDP in the January-March quarter of 2017-18, according to data released by the Reserve Bank of India (RBI). CCI imposed penalties on Sugar Mill - The Competition Commission of India (CCI) imposed penalties upon 18 sugar mills and 2 Associations for rigging the bids in respect of a Joint Tender floated by Oil Marketing Companies (HPCL, BPCL, and IOCL) in 2013 for procurement of ethanol for blending with petrol. Merger of the Vodafone Idea Limited - The Board of Directors of Vodafone Idea Limited, India's largest telecom operator approved merger of the Vodafone Idea Limited with the Aditya Birla Telecom Limited (ABTL), the parent company of Idea Cellular. Reserve Bank of India (Note Refund) Amendment Rules - 2018 - Reserve Bank of India has released new guidelines for all notes which were introduced post note ban, or notes which were introduced as part of the Mahatma Gandhi New Series. Reserve Bank of India (Note Refund) Rules earlier only specified currency notes of Rs 5, Rs 10, Rs 50, Rs 100, Rs 500, Rs 1,000, Rs 5,000 and Rs 10,000 denomination. As per the new Reserve Bank of India (Note Refund) Amendment Rules, 2018, "the undivided area of the single largest piece of the note" for a damaged Rs 2000 note must be 88 square cm for a full refund, and 44 square cm for half refund. The Rs 2000 note is 109.56 square cm in dimension. For a damaged Rs 200 note, the criteria is 78 square cm for a full refund, and 39 square cm for half refund. Wholesale prices Eased - Inflation based on wholesale prices eased to a four-month low of 4.53% in August on softening of prices of food articles, especially vegetables. Inflation of July month was 5.09%. Credit Suisse Family 1000 in 2018 - India ranks third globally in terms of number of family-owned businesses with 111 companies having a total market capitalisation of $839 billion. India closely follows China with 159 firms and the US with 121 firms, according to the ‘Credit Suisse Family 1000 in 2018’ study, published by the Credit Suisse Research Institute (CSRI). RBI report on Export and Import - India’s overall exports (Merchandise and Services combined) in April-August 2018-19 (as per the RBI Press Release) are estimated to be USD 221.83 Billion, exhibiting a positive growth of 20.70% over the same period last year. Overall imports in April-August 2018-19 are estimated to be USD 269.54 Billion, exhibiting a positive growth of 21.01% over the same period last year. Tax Rebate on Masala Bond - The Central Board of Direct Taxes (CBDT) announced that no withholding tax will apply on interest payments made by an Indian company or a business trust to a non-resident in respect of offshore rupee-denominated bonds issued between September 17, 2018 and March 31, 2019. PayU India Got Approval - PayU India has received Reserve Bank of India’s approval to operate its own non-banking financial company (NBFC). Coal Gasification based fertilizer project - Cabinet Committee on Economic Affairs approved the proposal of the Department of Fertilizers for equity investment of Rs 1033.54 crore for setting up a Coal Gasification based fertilizer project in Talcher Fertilizer Ltd (TFL) by Rashtriya Chemicals & Fertilizers Limited (RCF). United Nation General Assembly Meeting - Speaking at the 73rd United Nation General Assembly in New York, External Affairs Minister Sushma Swaraj said that Pakistan is an expert in spreading terror and denying it at the same time. Sushma Swaraj visited New York, USA to attend United Nation General Assembly Meeting. India and USA Signed COMCASA Agreement - India and the United States signed the Communications Compatibility and Security Agreement (COMCASA) during their first-ever ‘two plus two’ dialogue, which was held in New Delhi on September 6, 2018. Two plus two dialogue is high-level talks between foreign and defence ministries of the two nations. India’s External Affairs Minister Sushma Swaraj and Defence Minister Nirmala Sitharaman hosted the US Secretary of State Michael Pompeo and US Secretary of Defence James Mattis. COMCASA Agreement - COMCASA is stands for 'Communications Compatibility and Security Agreement'. COMCASA is an India-specific version of the Communication and Information on Security Memorandum of Agreement (CISMOA). India-Bangladesh Friendship Product Pipeline Project - Prime Minister Narendra Modi and his Bangladesh counterpart Sheikh Hasina jointly launched the construction of India-Bangladesh Friendship Product Pipeline Project through video conferencing. They also launched three projects - Rehabilitation of Kulaura-Shahbazpur section of Bangladesh Railways; 500 MW additional power supply from India to Bangladesh; and Akhaura–Agartala Rail Link. Tripartite Meeting Between India, Iran and Afghanistan - India, Iran and Afghanistan held their first tripartite meeting on September 11, 2018 in Kabul during which implementation of the Chabahar port project and a host of other issues including ways to deepen counter-terror cooperation were discussed. High Level Meeting on Tuberculosis - J P Nadda, Union Minister of Health and Family Welfare addressed at the ‘High Level Meeting on Tuberculosis at 73rd session of United Nations General Assembly (UNGA) at New York’. He stated that India plans to eliminate TB by 2025, five years ahead of the SDG target of 2030, by launching the TB Free India Campaign. Data Leak in Facebook - Facebook admitted that hackers broke into nearly 50 million users’ accounts by stealing their “access tokens” or digital keys. IMF Loan to Argentina - Argentina has received $57.1 billion from the International Monetary Fund (IMF), the biggest loan package ever from the global body aimed at boosting the country's struggling economy. NITI Aayog and UN signed MoU - NITI Aayog and United Nations in India signed the Sustainable Development Framework (UNSDF) for 2018-2022 at an event in New Delhi. Rail Link in Uzbekistan - India will be invited to help with a key rail link in Afghanistan, during the visit of Uzbekistan’s President Shavkat Mirziyoyev early next week. The rail link of approximately 650 km, connecting the Afghan cities of Mazaar-e-Sharif and Herat, which may later be extended to Kabul. India and Morocco signed MoU - India and Morocco signed a Memorandum of Understanding (MoU) for deepening cooperation between Micro, Small and Medium Enterprises (MSME) sectors of the two countries. India and Uzbekistan signed MoU - Union Cabinet approved the Memorandum of Understanding (MoU) signed between India and Uzbekistan on mutual cooperation in combating illicit trafficking in narcotics, drugs, psychotropic substances and precursors. Uzbek-Indian Free Pharmaceutical Zone - Union Cabinet has approved the MoU between India and Uzbekistan for establishment of the Uzbek-Indian Free Pharmaceutical Zone in the Andijan Region of Uzbekistan. The MoU will be signed during the visit of President of Uzbekistan to India on October 1, 2018. NITI Aayog and MFDRF signed MoU - Union Cabinet has given its approval for signing of a Memorandum of Understanding (MoU) between National Institute for Transforming India (NITI) Aayog, and Ministry of Economic Development of the Russian Federation (MEDRF) in the field of social, economic, industrial and regional development programs. India and South Korea signed MoU - Union Cabinet chaired by Prime Minister Narendra Modi has been apprised of the Memorandum of Understanding (MoU) between India and South Korea on cooperation in Applied Science and Industrial Technology. India and China will sign MoU - India and China will sign an internal security cooperation agreement during the forthcoming visit of China's Minister of Public Security to India. Zhao Kezhi, China's Minister of Public Security will visit India in October 2018 . Gandhi March in Netherlands - India will organise 'Gandhi March' from the iconic Peace Palace at the Hague to Grote Kerk to launch the two-year long celebrations of the 150th birth anniversary of Mahatma Gandhi. India and Morocco signed MoU - India and Morocco signed the revised Air Services Agreement between the two countries enabling greater connectivity through a modernized agreement. India and Niger signed MoU - India and Niger signed an MoU for the implementation of Mahatma Gandhi International Convention Centre (MGICC) in Niamey, Niger with the Indian government's grant assistance. India and ADB signed Loan Agreement - India and Asian Development Bank have signed 346 Million dollar loan agreement to improve over 400 kilometers of state highways in Karnataka. Programme for International Student Assessment (PISA) Boycott - The Union Human Resource Development (HRD) Minister Prakash Javadekar decided to end the Programme for International Student Assessment (PISA) boycott. Resultantly, the ministry will send a team of officers to Paris this year to negotiate India’s terms of participation in PISA 2021 with the Organisation for Economic Cooperation Development (OECD). India and Nepal signed MoU - India and Nepal signed a Memorandum of Understanding (MoU) on conducting a preliminary survey of a railway line connecting Indian border town Raxaul to Nepal's capital Kathmandu. India and France signed MoU - India and France signed an implementation agreement on ‘Mobilise Your City’ (MYC) in New Delhi to support three Indian cities in their efforts to reduce Green House Gas (GHG) emissions. Three cities are Nagpur, Kochi and Ahmedabad. India and Cyprus signed MoU - Indian President Ram Nath Kovind visited Cyprus. India and Cyprus signed key agreements on combating money laundering and the field of environment to cement bilateral ties between both the countries following delegation level talks between President Ram Nath Kovind and Cyprus President Nicos Anastasiades. Bus Services Between Bihar and Nepal - For the first time, bus services between Bihar and Nepal have started. The bus service was flagged off from Patna by the Chief Minister Nitish Kumar. Four buses will launch from Bodhgaya to Kathmandu. Similarly, four buses will launch from Patna to Janakpur. Marc Benioff acquired Time Magazine - Salesforce.com Inc. founder Marc Benioff and his wife Lynne agreed to acquire Time magazine from Meredith Corp. for $190 million in cash. India and World Bank Singed Loan Agreement - A Loan Agreement for IBRD (International Bank for Restructure and Development) Credit of USD 74 million for the Uttrakhand Workforce Development Project (UKWDP) was signed between India and the World Bank. India and South Africa Signed MoU - The Union Cabinet was apprised of the Memorandum of Understanding (MoU) between India and South Africa on cooperation in the exploration and uses of outer space for peaceful purposes. The MoU was signed in Johannesburg. India and Egypt Signed MoU - Union Cabinet approved the signing of a Memorandum of Understanding (MoU) between India and Egypt for cooperation in the field of agriculture & allied sectors. India and France signed MoU - India and France have signed an implementation agreement on 'Mobilise Your City' (MYC). Mobilise Your City (MYC) is part of an international initiative which is supported by the French and the German Governments and was launched at 21st Conference of Parties (COP21) meeting. India and Malta signed MoU - Union Cabinet approved signing of the Memorandum of Understanding (MoU) between India and Malta for strengthening cooperation in the field of Tourism. MoU will be signed during the upcoming visit of the Vice President to Malta. India and Morocco signed MoU - India and Morocco signed the revised Air Services Agreement enabling greater connectivity between the two countries through a modernised agreement. Bullet Train From Kolkata to Kunming City - Chinese Consul-General in Kolkata, Ma Zhanwu announced that China is looking forward to plan bullet trains from Kolkata to Kunming City of China. The train is expected to traverse through Myanmar and Bangladesh. South Korea and North Korea Signed Agreement - In a historic move, North Korean leader Kim Jong Un and South Korean President Moon Jae-in signed an agreement on denuclearisation, reducing military tensions and defusing crisis on the Korean peninsula. The talks were hosted by North Korea in its capital city Pyongyang. India and Bangladesh Signed MoU - Bangladesh's cabinet has approved a draft agreement with India to enable New Delhi to use the Chittagong and Mongla ports for the movement of goods to and from northeast India. Delhi Government and South Korea Signed MoU - The Delhi government signed a Memorandum of Understanding with the Seoul Metropolitan Government to work closely in the fields of environment, tourism, waste water and solid waste management, infrastructure and public health. European Union and Hungary - The European Union legislators have voted overwhelmingly in favour of launching punitive action against the Hungarian government for flouting democratic rules. India and South Africa signed MoU - Union Ministry of External Affairs (MEA) and Telecommunications Consultants India Ltd (TCIL) signed agreement for implementation of e-VidyaBharati and e-AarogyaBharati (e-VBAB) Network Project in Africa. The project is seen as digital bridge of knowledge and health between India and Africa. PM Launched Pradhan Mantri Jan Arogya Yojana - Prime Minister Narendra Modi on September 23, 2018 launched the flagship scheme 'Pradhan Mantri Jan Arogya Yojana' (PMJAY), also known as Ayushman Bharat or the National Health Protection Mission (AB-NHPM) at Ranchi. Prime Minister also launched a toll free number 14555 for people to get more information about Ayushma Bharat scheme. The scheme will become operational from September 25, 2018, the birth anniversary of Deendayal Upadhyay. Ayushman Bharat - Ayushman Bharat, the government-sponsored health insurance scheme, will provide free coverage of up to Rs 5 lakh per family per year in any government or even empanelled private hospitals all over India. Scheme will be available for 10.74 crore beneficiary families and about 50 crore Indian citizens. Ayushman Bharat programme will be funded with 60 percent contribution from the Centre and the remaining from the states. There will be no cap on family size and age in the scheme. For beneficiaries, it will be a cashless and paper less transaction. Pradhan Mantri Jan Dhan Yojana - The Union Government decided to make the Pradhan Mantri Jan Dhan Yojana (PMJDY) an open-ended scheme and added more incentives to encourage people to open bank accounts. Under the new incentives, the overdraft limit for account holders has now been doubled to Rs 10000. The free accident insurance cover for those opening Jan Dhan accounts after August 28 too has been doubled to Rs 2 lakh. The upper age limit for availing the facility has also been hiked to 65 from the earlier 60 years. Pradhan Mantri Annadata Aay SanraksHan Abhiyan - Union Cabinet chaired by Prime Minister Narendra Modi approved a new umbrella scheme ‘Pradhan Mantri Annadata Aay SanraksHan Abhiyan’ (PM-AASHA). The scheme aims to ensure that farmers get remunerative prices for their produce as announced in the Union Budget for 2018. The Government had previously increased the MSP of Kharif crops by following the principle of 1.5 times the cost of production. New Umbrella Scheme includes - Price Support Scheme (PSS), Price Deficiency Payment Scheme (PDPS), and ilot of Private Procurement and Stockist Scheme (PPPS). National Digital Communications Policy 2018 - The Cabinet approval for the new telecom policy, now renamed as ‘National Digital Communications Policy 2018’, is expected to propel India into the top 50 on a global index from as low as 134. The new policy seeks to attract a whopping $100 billion investments and create as many as 40 lakh jobs in the telecommunications sector by 2022. Policy is to focus on increasing high-speed broadband penetration by using modern technologies like 5G, IOT (Internet of things), and M2M (machine-to-machine) and optical fibres across the country at an affordable price through satellite to about 90% of population as well as provide at least 1 GBPS data connectivity to all Gram Panchayats to enable wireless broadband services to inhabitants. Universal Old Age Pension Scheme - Assam has decided to introduce a universal old age pension scheme to cover all BPL and APL ration card holders above the age of 60 years. One Nation-One Card Policy for Public Transport - NITI Aayog Chief Executive Officer Amitabh Kant announced that India will shortly unveil a One Nation-One Card policy for public transport that will entail connectivity between various modes of transport. The announcement was made at a function on Future Mobility Summit-2018 in New Delhi. Pradhan Mantri Fasal Bima Yojana - The Union Government released the new operational guidelines for implementation of the Pradhan Mantri Fasal Bima Yojana (PMFBY). The farmers will now be paid 12 percent interest by insurance companies for the delay in settlement claims beyond two months of prescribed cut-off date. Atal Bimit Vyakti Kalyan Yojna - The Employee's State Insurance (ESI) has approved a scheme named ‘Atal Bimit Vyakti Kalyan Yojna’ for Insured Persons (IP) covered under the Employees’ State Insurance Act, 1948. This scheme is a relief payable in cash directly to the bank account of insured persons in case of unemployment and while they search for a new engagement. Delhi Government Launched Doorstep Delivery Services - The Delhi government launched a scheme that will enable doorstep delivery of 40 essential government services such as caste and marriage certificates, driving license and new water connections in the first phase. The services will be provided for an extra fee of Rs 50. Swachhata Hi Seva Campaign - The Swachhata hi Seva Campaign 2018, a Jan Andolan for Swachhata, will be launched by Prime Minister Narendra Modi on September 15, 2018. The campaign will be observed in the run-up to the 4th anniversary of the Swachh Bharat Mission (SBM) on October 2. Smart Fence on India-Pakistan International Border - India’s first ‘smart fence’ pilot project was inaugurated by Union Home Minister Rajnath Singh along the India-Pakistan International Border in Ploura, Jammu and Kashmir. The pilot project involves deploying of laser-activated fences and technology-enabled barriers to plug vulnerable gaps along the frontiers. Rail Sahyog' Web Portal - Railways Minister Piyush Goyal launched the 'Rail Sahyog' web portal to provide a platform for the Corporates and Public Sector Units (PSUs) to contribute to creation of amenities at or near Railway Stations through Corporate Social Responsibility funds. Chiller Star Labelling Program - The Union Ministry of Power launched the Chiller Star Labelling Program, an ambitious program to encourage the deployment of energy efficient chiller systems in the country. Chillers are used extensively for space conditioning of buildings and for industrial process cooling applications. The Chiller Star Labelling Program envisages providing star rating in terms of its energy performance. The program has been formulated by Bureau of Energy Efficiency (BEE). National Scholarship Portal Mobile App - Union Minister for Minority Affairs, Mukhtar Abbas Naqvi launched the country's first "National Scholarship Portal Mobile App" (NSP Mobile App). All the scholarships are being given directly into bank accounts of the needy students under Direct Benefit Transfer (DBT) mode through the National Scholarship Portal. e-Sahaj for Security Clearance - The Union Home Secretary Rajiv Gauba launched an online portal – ‘e-Sahaj’ for grant of security clearance to private firms. Deendayal Antyodaya Yojana – National Rural Livelihoods Mission - Union Cabinet approved the extension of timeline for implementation of the Special Package under Deendayal Antyodaya Yojana – National Rural Livelihoods Mission (DAY-NRLM) for Jammu & Kashmir for another period of one year during 2018-19. First Tribal Circuit Tourism Project - India’s first tribal circuit tourism project under the Swadesh Darshan scheme will be inaugurated at Gangrel in Chhattisgarh. Bhamashah Yojana - Rajasthan government will soon distribute mobile phones to women under the Bhamashah Yojana. Focused on women who fall under the Below Poverty Line (BPL), the scheme aims to transfer financial and non-financial benefits of government schemes in a transparent manner. Astra Missile Tested - Astra, the indigenously developed Beyond Visual Range Air-to-Air Missile (BVRAAM), was successfully test fired by the Indian Air Force from Su-30 aircraft from Air Force Station, Kalaikunda in Midnapore, West Bengal. Its Range is 20 Kilometer. Prahaar Missile - India on September 20, 2018 successfully test-fired the indigenously developed surface-to-surface, short-range tactical ballistic missile 'Prahaar' from Integrated Test Range (ITR) at Chandipur, Odisha coast. The missile has been developed by the Defence Research and Development Organisation (DRDO). Range is 200 km. Integrated Control Room for Emergency Response (ICR-ER) - The Union Ministry of Home Affairs (MHA) and the Indian Space Research Organization (ISRO) signed a Memorandum of Understanding (MoU) for setting up the state-of-the-art Integrated Control Room for Emergency Response (ICR-ER) in Ministry of Home Affairs. Mars Orbiter Mission - India’s maiden interplanetary mission — the Mars Orbiter Mission (MOM) — has completed four years orbiting the red planet, though the designed mission life of MOM was six months. The mission, launched on November 5, 2013, placed itself into the Martian orbit on September 24, 2014. Combat Aircraft FTC-2000G - China’s indigenously-built The FTC-2000G, new multi-role combat aircraft for exports by the State-owned Aviation Industry Corp of China (AVIC), made its debut flight on Friday in the Guizhou province. BIMSTEC – Joint Military Exercise - BIMSTEC Military Exercise (MILEX-18), the first edition of Military Field Training Exercise for the Bay of Bengal Initiative for Multi-Sectoral Technical and Economic Cooperation (BIMSTEC) nations, started at Aundh in Pune. The aim of MILEX-18 is to practice the BIMSTEC Nations in planning and conduct of counter-terrorist operations. Participating countries are Armies of India, Bangladesh, Bhutan, Sri Lanka, Myanmar and Thailand. Nepal is not taking part in MILEX-18. Yudh Abhyas Exercise - Exercise Yudh Abhyas 2018, a joint military exercise of Indian and US armies, commenced at Chaubattia, Uttarakhand. This is the 14th edition of the joint military exercise hosted alternately by both countries. SLINEX Exercise - The sixth edition of ‘SLINEX 2018’, a joint naval exercise between the naval forces of India and Sri Lanka is currently underway in Trincomalee, Sri Lanka. The bilateral exercise, which was previously held once in two years, will be held as an annual event from this year onwards. Rapid Trident Exercise - Ukraine has launched annual joint military exercise named Rapid Trident with the United States and other NATO (North Atlantic Treaty Organization) member countries. It is being conducted week before Russia holds its biggest military exercise Vostok-2018 since the Cold War, in the eastern part of the country and with the participation of China and Mongolia. Joint Military Exercise Between Nepal and China - The second edition of Nepal-China joint military exercise named Mt Everest Friendship Exercise 2018 (Sagarmatha Friendship-2018) commenced in China’s southwestern Sichuan province. The 12 day long joint exercise will focus on combating terror and disaster management trainings. Sagarmatha is the Nepali name for Mt Everest, which stands in between both the countries. KAZIND Exercise - Joint Army Exercise ‘KAZIND’ will be conducted between the Indian and Kazakhstan Army from September 10 to 23, 2018 in Otar region, Kazakhstan. Indian Ocean Wave Exercise - Indian Ocean Wave Exercise 2018 (IOWave18) began on September 4, 2018 in the Indian Ocean. India along with 23 other nations is participating in this major Indian ocean-wide tsunami mock drill which involves evacuation of thousands of people from coastal areas in over half a dozen coastal states. Nomadic Elephant Exercise - India, Mongolia joint exercise Nomadic Elephant 2018 commenced at Mongolian Armed Forces (MAF) Five Hills Training Area in Ulaanbaatar (capital of Mongolia). Nomadic Elephant is annual bilateral military exercise started in 2006. Man-Portable Anti-Tank Guided Missile - India’s Defence Research and Development Organisation (DRDO) conducted the first successful flight test of its new indigenously designed and developed low weight man-portable anti-tank guided missile (MP-ATGM) at Ahmednagar test range in Maharashtra. The first successful test firing was followed by another test launch on September 16. ISRO launched British Satellite - The Indian Space Research Organisation (ISRO) successfully launched its polar satellite launch vehicle (PSLV) C42 carrying two earth observation satellites for the United Kingdom. PSLV C42 carried two earth observing satellites - NovaSAR and S1-4 of Surrey Satellite Technology Limited, UK. There was no Indian satellite on the flight. ISRO inaugurated Weather Radar - Indian Space Research Organisation (ISRO) inaugurated S–Band Polarimetry Doppler Weather Radar (DWR) at Satish Dhawan Space Centre in Sriharikota spaceport, Andhra Pradesh. It will be used for observation of weather system up to range of 500 km and also for early warning of severe weather events. Rovers on Asteroid - Japan Aerospace Exploration Agency (JAXA) landed a pair of rovers on an asteroid, marking the world's first moving, robotic observation of an asteroid surface. The small compact MINERVA-II1 (MIcro Nano Experimental Robot Vehicle for Asteroid, the second generation) rovers separated from the Hayabusa2 spacecraft. The MINERVA-II 1 consists of two rovers, Rover-1A and Rover-1B. Defence Procurement - Defence Acquisition Council (DAC) approved procurement of 1,000 engines for fitment in T-72 tanks of the Indian Army at an approximate cost of over Rs 2,300 crore. Space Technology Incubation Centre - Tripura Chief Minister Biplab Kumar Deb inaugurated ISRO’s first Space Technology Incubation Centre (STIC) at the National Institute of Technology Agartala via remote from Bengaluru. Yusaku Maezawa – Space Passenger - US private space firm SpaceX signed the world’s first private passenger to fly around the Moon aboard its Big Falcon Rocket (BFR) launch vehicle. Japanese billionaire and founder of online fashion giant Zozo, Yusaku Maezawa will be the first Moon tourist. Bengaluru Space Expo - The 6th edition of the biennial Bengaluru Space Expo was inaugurated by ISRO Chairman Dr.K Sivan in Bengaluru, Karnataka. Aero India - The next edition of Aero India will be held in Bengaluru, Karnataka from February 20 to 24, 2019, Defence Ministry announced. Oldest Research Reactor Apsara - India’s oldest research reactor 'Apsara', which was shut down permanently in 2009 for repair, was recommissioned with a higher capacity on September 10, 2018 at Bhabha Atomic Research Centre, Trombay. Apsara, the first research reactor of Asia, became operational in Trombay campus of Bhabha Atomic Research Centre in August 1956. Tejas refuelled mid-air by IL 78 - In a first, Tejas, the advanced version of India’s indigenously produced Light Combat Aircraft (LCA) was successfully refuelled mid-air by a Russian-origin Ilyushin-78 tanker. Akash Missile Systems - Defence Acquisition Council (DAC) has approved the procurement of equipment for the Defence Forces valued at over Rs 9100 crore. The council chaired by Defence Minister Nirmala Sitharaman approved procurement of two Regiments of Akash Missile Systems. India and France signed MoU on Gaganyaan Mission - India and France signed a Memorandum of Understanding (MoU) to constitute a working group for Gaganyaan Mission, India’s first manned space mission. NASA launched ICESat-2 - NASA launched its Ice, Cloud and Land Elevation Satellite-2, known as ICESat-2, which will use an extremely precise laser to collect measurement data to track the Earth's shrinking polar ice from Vandenberg Air Force Base in California. Committee to Recommend Lokpal - Modi government constituted an eight-member search committee, to be headed by former Supreme Court judge Justice Ranjana Prakash Desai, to recommend the chairperson and members of the anti-corruption ombudsman Lokpal. The committee has former chief of State Bank of India (SBI) Arundhati Bhattacharya, Prasar Bharati chairperson A Surya Prakash and Indian Space Research Organisation (ISRO) head A S Kiran Kumar as members. Study on Education and Health - India ranks 158th in the world for its investments in education and health care, according to the study published in journal The Lancet. The nation is placed behind Sudan (ranked 157th). Committee on Jail Reform - Supreme Court constituted a three-member committee headed by former SC judge Justice Amitava Roy to look into the problems of jails in India and suggest reform measures. Barclays-Hurun India Rich List - According to a Barclays-Hurun India rich list there has been a 34 per cent increase in the number of Indians having a net worth of Rs 1,000 crore or more. Significantly, these individuals who number 831, collectively own a quarter of the nation’s GDP with a net worth of USD 719 billion. Annual Financial Inclusion Index - Finance Ministry will release an Annual Financial Inclusion Index (FII), which will be a measure of access and usage of several formal financial products and services that includes savings, remittances, credit, insurance and pension products, the government said. Finance Minister also ensured the availability of banking facilities every 5 kilometres. Global Metro Monitor 2018 - In the global ranking of 300 best performing and fastest growing metropolitan cities, national capital Delhi has been ranked sixth, according to Brookings’ study Global Metro Monitor 2018. Delhi’s per capita GDP surged by 6.6 percent between 2014-16. Meanwhile, Hyderabad has been ranked 14th on the list with Mumbai on 23rd place in the ranking. Dublin, the capital city of Ireland, leads the chart. Ease of Living Index - Andhra Pradesh has topped the chart in the ‘Ease of Living Index’ rankings under the Atal Mission for Rejuvenation and Urban Transformation (AMRUT), followed by Odisha and Madhya Pradesh. Global TB Report - The World Health Organisation (WHO) released the 2018 Global TB Report in New York. The report calls for an exceptional mobilisation of national and international commitments enough to end Tuberculosis (TB) by 2030. Country Partnership Framework (CPF) - The World Bank board has approved an ambitious five-year Country Partnership Framework (CPF) for India that is in line with India’s objectives of high, sustainable and inclusive growth for the period FY18-22. It is to support India’s transition to a high-middle income economy. Mizoram - Mizoram had the highest adult HIV prevalence among states in India last year with the infection being detected in 2.04 per cent of the people according to a report released by National AIDS Control Organisation (NACO) stated. Nationwide Program of Non Communicable Diseases - The Union Ministry of Health and Family Welfare signed Memorandums of Understanding (MoUs) with the Tata Trusts and Dell to provide technological platform for nationwide prevention, control, screening and management program of Non Communicable Diseases (NCDs). UN Report on Food Security and Nutrition - As per a UN report on the ‘state of food security and nutrition in the world’ that was published, the number of undernourished globally increased to 821 million in 2017, which means that one in every nine people, does not have enough to eat. The death of children below the age of five years continues to steadily reduce in India, declining from nearly 22 per cent in 2012 to 18 per cent in 2017. The Rule Breakers - Best-selling author Preeti Shenoy announced the launch of her new book, 'The Rule Breakers'. National Hindi Divas - National Hindi Divas was observed across India on September 14, 2018 to promote Hindi as Matra Bhasha (mother tongue) of India. On this occasion, Vice President M Venkaiah Naidu presented the Rajbhasha Awards to chiefs of various departments, Ministries and offices including State-run Punjab National Bank (PNB). Antyodaya Diwas - Prime Minister Narendra Modi on September 25, 2018 paid tributes to Deendayal Upadhyaya on his birth anniversary. 25th September is observed as Antyodaya Diwas every year to mark the birth anniversary of Deendayal Upadhyaya. Nelson Mandela Decade of Peace - A statue of Nelson Mandela was unveiled at the United Nations to honour the late South African leader's birth. This year marks the 100th birth anniversary of Nelson Mandela and the UN is declaring 2019-2028 the "Nelson Mandela Decade of Peace”. Parakram Parv - The day Sept 29 marks the eve of second anniversary of 2016’s surgical strikes against terror pods in Pakistani territory by Indian forces. ‘Parakram Parv’ is being observed from Sept 28-30, which will have an overall theme of ‘valour’ of the armed forces with the focus being on the strikes. International Day for Preservation of Ozone Layer - The International Day for Preservation of Ozone Layer was observed globally on September 16, 2018 with the theme ‘Keep Cool and Carry On: The Montreal Protocol’. International Day of Peace - International Day of Peace was observed across the world on September 21, 2018. The International Day of Peace is also a day of ceasefire. Theme is The Right to Peace - The Universal Declaration of Human Rights at 70. Pravasi Bharatiya Divas - The 15th Pravasi Bharatiya Divas will be held in Varanasi, Uttar Pradesh from January 21 to January 23, 2019. The theme of the 2019 will be “Role of Indian Diaspora in Building a New India”. It will be inaugurated by Prime Minister Narendra Modi and his Mauritian counterpart Pravind Jugnauth. Pravasi Bharatiya Divas is celebrated every year in India on 9 January. World Tourism Day - World Tourism Day is observed every year globally on 27th September. “Tourism and the Digital Transformation” is the theme of this year’s World Tourism Day (WTD). Hungary is the host country for this year's WTD. India will be the host country for next year. World Rabies Day - World Rabies Day was observed across the globe on September 28, 2018. The theme of the day for the year 2018 is 'Rabies: Share the message. Save a life'. Engineer's Day - Mokshagundam Visvesvaraya's birthday is celebrated on 15 September as Engineer's Day. International Day of Charity - The International Day of Charity was observed globally on September 5, 2018. Day commemorates death anniversary of Mother Teresa. International Day of Democracy - The International Day of Democracy was observed across the world on September 15, 2018. The theme of the day was ‘Democracy under Strain: Solutions for a Changing World’. 17th Anniversary of 9/11 Terrorist Attacks - The United States of America on September 11, 2018 marked the 17th anniversary of 9/11 terrorist attacks that killed almost 3,000 people in New York, Virginia and Pennsylvania. National Nutrition Month - The National Nutrition Month is being celebrated across the country in September to mark the fight against malnutrition. Asian Yoga Sports Championship - The 8th Asian Yoga Sports Championship organised by Asian Yoga Federation has begun in Thiruvananthapuram, Kerala. World Footballer of The Year - Luka Modric crowned world footballer of the year by FIFA. Women’s Boxing World Championships - India will host Women’s Boxing World Championships from November 15-24, 2018, in New Delhi. Asian Team Snooker Championship - India settled for the silver medal after losing to Pakistan 2-3 in the final of the Asian Team Snooker Championship. Pankaj Advani and Malkeet Singh represented India . Lewis Hamilton - Lewis Hamilton won the Singapore Grand Prix. Virat Kohli and Mirabai Chanu - Indian cricket captain Virat Kohli and world champion weightlifter Mirabai Chanu were jointly recommended for this year's Rajiv Gandhi Khel Ratna award, the country's highest sporting honour. US Open Result - The 2018 US Open result - Men's Singles - Novak Djokovic (Serbia), Women's Singles - Naomi Osaka (Japan). Asian Games - India with a haul of 69 medals including 15 gold recorded its best-ever performance in the history of Asian Games at the 2018 edition held in Jakarta and Palembang in Indonesia. India also won 24 silver medals and 30 bronze medals. > It was the 1st time that Indian Kabaddi Team could not win Gold. > Swapna Barman became 1st Indian to win an Asiad gold in the women's heptathlon event. > Neeraj Chopra became 1st Indian javelin thrower to win an Asiad gold. > Dutee Chand Won India’s first medal in 20 years in a women's 100 event. > Bajrang Punia (Wrestling) won 1st Gold Medal for India in Asian Games 2018. Most Valuable Player - Japanese swimmer Ikee Rikako has been named as the Most Valuable Player (MVP) of the recently-concluded 18th edition of the Asian Games. The 18-year-old, who bagged six gold and two silver medals in the tournament, became the first female athlete to win the MVP title. Momo Challenge - The Women and Child Development Ministry has issued an advisory on the deadly online game Momo challenge, asking parents to monitor social media activity of their children. South Asian Football Federation - Maldives have lifted the 2018 South Asian Football Federation (SAFF) Cup in Dhaka. News J Channel - The ruling AIADMK in Tamil Nadu made a soft launch of its own channel 'News J' named after its late supremo J Jayalalithaa. The launch comes in the backdrop of Jaya TV, once considered the party's mouthpiece, being in the control of sidelined leader TTV Dhinakaran's relatives. e-cigarettes Banned - Tamil Nadu banned Electronic Nicotine Delivery Systems (ENDS), known as e-cigarettes, with immediate effect. Kempegowda International Airport - Kempegowda International Airport (KIA) of Bengaluru is set to become first airport in Asia to introduce face recognition based passage system technology from 2019. Supreme Court Decriminalised Section 377- A Five Judge Constitution Bench of the Supreme Court decriminalised Section 377 of the Indian Penal Code (IPC). No Permit for Electric Vehicle - Government has decided to exempt electric vehicles and automobiles run on alternative fuel from permit requirements. The move is in a bid to boost such vehicles in the country to bring down pollution.